For the second time in a decade, the believability ratings for major news organizations have suffered broad-based declines. In the new survey, positive believability ratings have fallen significantly for nine of 13 news organizations tested. This follows a similar downturn in positive believability ratings that occurred between 2002 and 2004. The falloff in credibility affects news organizations in most sectors: national newspapers, such as the New York Times and USA Today, all three cable news outlets, as well as the broadcast TV networks and NPR. Across all 13 news organizations included in the survey, the average positive believability rating (3 or 4 on a 4-point scale) is 56%. In 2010, the average positive rating was 62%. A decade ago, the average rating for the news organizations tested was 71%. Since 2002, every news outlet’s believability rating has suffered a double-digit drop, except for local daily newspapers and local TV news. The New York Times was not included in this survey until 2004, but its believability rating has fallen by 13 points since then. These are among the major findings of a survey by the Pew Research Center for the People & the Press, conducted July 19-22 among 1,001 adults. The survey asks people to rate individual news organizations on believability using a 4-point scale. A rating of 4 means someone believes “all or most” of what the news organization says; a rating of 1 means someone believes “almost nothing” of what they say. The believability ratings for individual news organizations – like views of the news media generally – have long been divided along partisan lines. But partisan differences have grown as Republicans’ views of the credibility of news outlets have continued to erode. Today, there are only two news organizations – Fox News and local TV news – that receive positive believability ratings from at least two-thirds of Republicans. A decade ago, there were only two news organizations that did not get positive ratings from at least two-thirds of Republicans. By contrast, Democrats generally rate the believability of news organizations positively; majorities of Democrats give all the news organizations tested ratings of 3 or 4 on the 4-point scale, with the exception of Fox News. The believability measures are based on those who give each news organization a rating. Roughly one-in-five are unable to rate the believability of NPR (21%), the New York Times (19%), the Wall Street Journal (19%) and USA Today (17%). 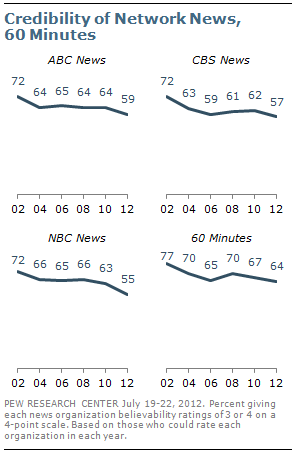 As in past believability surveys, local TV news and the CBS News program 60 Minutes receive the most positive ratings. Nearly two-thirds (65%) of those able to rate local TV news give it a rating of 3 or 4. Ratings are comparable for 60 Minutes (64% 3 or 4). Despite the declines in believability, majorities continue to give most news organizations ratings of 3 or 4. However, ratings are mixed for NPR, MSNBC, the New York Times, Fox News and USA Today. About half give each of these news organizations believability ratings of 3 or 4; approximately the same percentages give them ratings of 1 or 2. 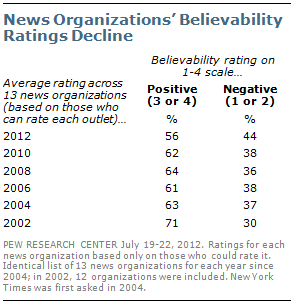 Positive believability ratings for the New York Times have fallen by nine points since 2010, from 58% to 49%. The decline has been comparable for USA Today. Two years ago, 56% rated USA Today’s believability at 3 or 4; today 49% do so. About six-in-ten (58%) rate the Wall Street Journal’s believability positively. That is little changed since 2010 (62%), but in 2002, 77% rated the Journal’s believability at 3 or 4 on the 4-point scale. Perceptions of the believability of the daily newspaper “you are most familiar with” are about the same as they were two years ago. 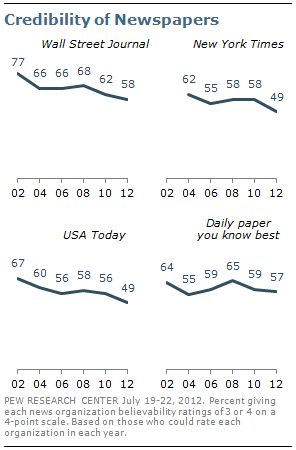 Currently, 57% give their daily newspaper a positive believability rating, which is little changed from 2010 (59%). Believability ratings for all three major cable news outlets have declined since 2010. MSNBC’s believability rating has fallen from 60% to 50%, while the percentages giving CNN and Fox News believability ratings of 3 or 4 have declined seven points each, to 58% and 49%, respectively. In 2002, the ratings for all three cable news outlets were considerably higher – 76% for CNN, 73% for MSNBC and 67% for Fox News. The believability ratings for local TV news are higher than those for the three cable news outlets. Currently, 65% give local news a rating of 3 or 4. 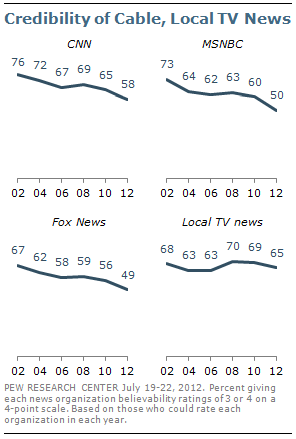 Since 2002, credibility ratings for local TV news have remained more stable than have ratings for the three main cable news outlets. There also have been slight declines since 2010 in believability ratings for the three major TV networks — ABC News, CBS News and NBC News. Over the past decade, positive ratings for all three have fallen from the low 70s to the mid- to high-50s. More than six-in-ten (64%) give the CBS weekly newsmagazine 60 Minutes believability ratings of 3 or 4. That is down 13 points since 2002. 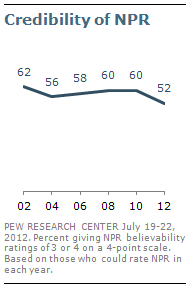 Since 2010, the percentage giving NPR believability ratings of 3 or 4 has dropped eight points to 52%. NPR’s believability ratings had changed little from 2002 to 2010; about six-in-ten in each year rated NPR’s believability positively. Republicans have long held a more negative view of the credibility of the news media than Democrats and this continues to be reflected in current assessments of news outlets. Republicans rate the believability of nine of 13 news organizations less positively than do Democrats. Fox News is the only news organization that is rated higher for believability by Republicans (67% of Republicans vs. 37% of Democrats). 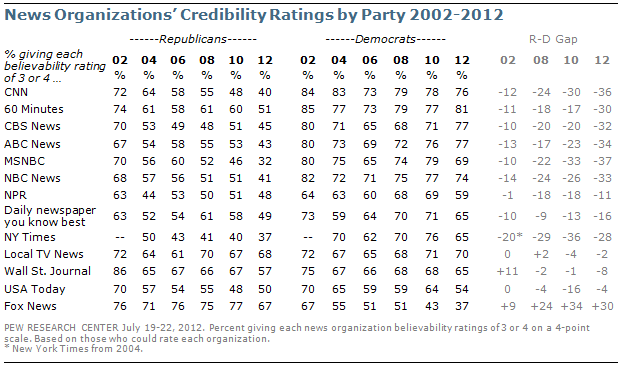 However, the percentage of Republicans giving Fox a believability rating of 3 or 4 has fallen 10 points, from 77%, since 2010. Partisan differences in believability ratings are more pronounced for broadcast and cable TV news organizations, with more modest gaps for most newspapers. 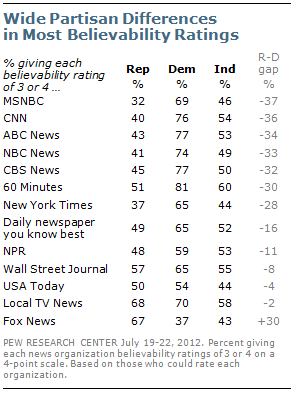 More than twice as many Democrats as Republicans rate MSNBC’s believability positively (69% vs. 32%). The differences are about as large in views of the believability of CNN and the three broadcast networks. The partisan divide in views of the New York Times’ believability also is substantial; 65% of Democrats, but just 37% of Republicans, rate the believability of the Times at 3 or 4. However, there are smaller differences in views of other newspapers. More Democrats (65%) than Republicans (49%) give positive ratings for the newspaper they know best, but about as many Republicans as Democrats rate the believability of the Wall Street Journal and USA Today positively. A majority of Democrats (59%) give NPR a believability rating of 3 or 4. That compares with 48% of Republicans. The partisan differences in views of the believability of most news organizations have increased greatly since 2002. For example, the partisan gap in believability of each of the cable networks was only about 10 points a decade ago; today, the gaps in believability ratings for Fox News, MSNBC and CNN are at least 30 points.